Here are actual patient results from the Total Cure bad breath treatment. 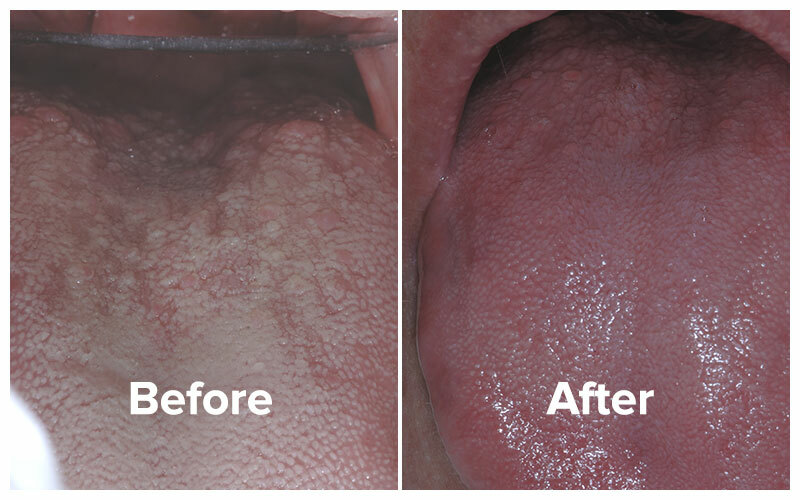 These before and after photos (click to enlarge the images) show actual patients who have had the Total Cure treatment which includes Tongue Rejuvenation. 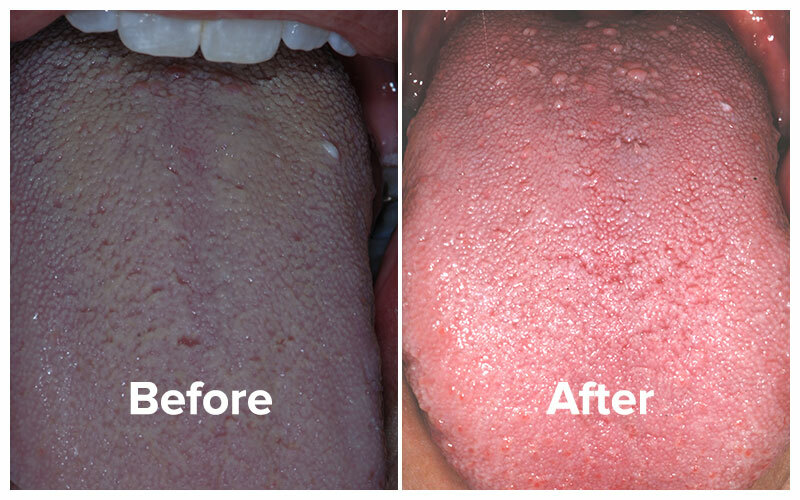 The photos show the tongue biofilm present before treatment and the visible results after the tongue rejuvenation process of the Total Cure. 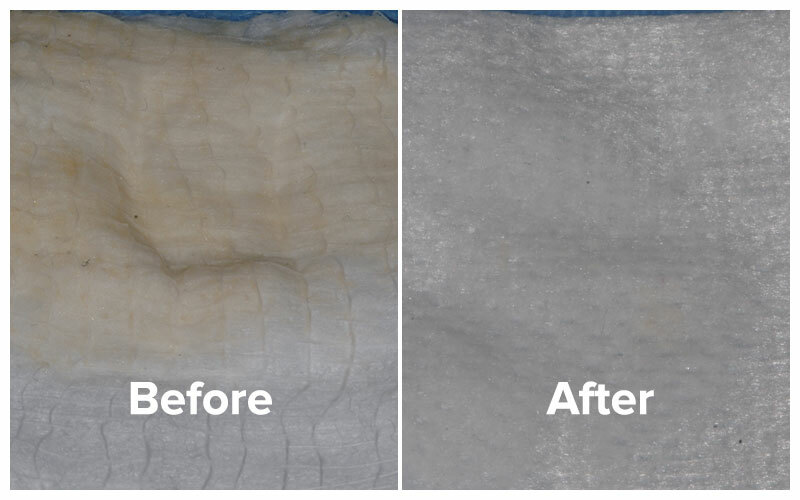 In addition, before and after photos of the Gauze Test used during the comprehensive halitosis examination (breath severity tests) and after treatment are shown. The following Before & After photos are accompanied by a case study of each patient’s journey to the bad breath Total Cure. Click on the links below to learn each patient’s experience before, during and after treatment. For Chelsea, bad breath was affecting her both on the job and in her personal relationships. Dr. Miller met 50-year-old Chelsea in November 2012 due to her bad breath problem. At the first visit, she related how her co-workers and her husband had made gestures as if she had bad breath. While no one told her directly, they would move away when she was near, cover their mouths and noses, offer her gums and mints, and generally try to avoid her. But her main embarrassment and what really drove her to see me was that her patients moved back or made similar gestures. She is a respiratory therapist that could not get up close to her patients without some strong cover-up. Chelsea came in with an optimistic view of the world. She is a kind, gentle person who loves life and considered her bad breath something that could be solved. She had searched the Internet and found Dr. Miller as the author of the original book, Beating Bad Breath. 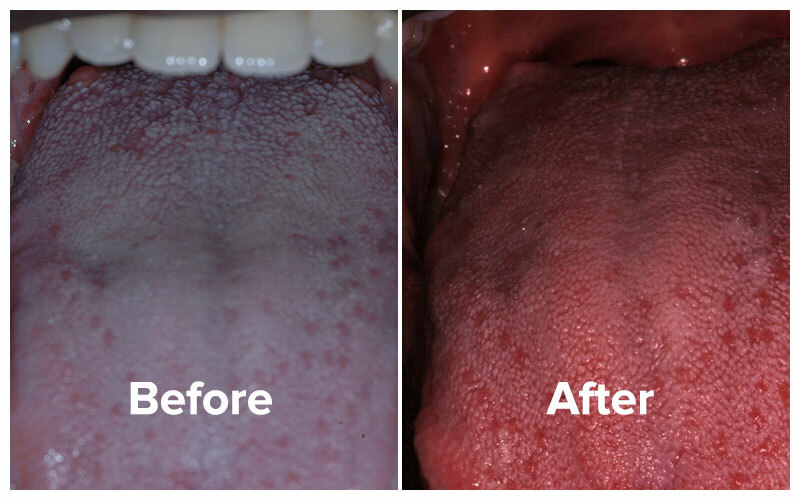 These photos show a stark contrast of the gauze coating at the first visit and the last, and a near total removal of the tongue biofilm. These changes took her Halimeter reading from 285 to 65, well below discernible mouth odor. One year later, she is still halitosis-free, uses a minimum of products, and says she no longer worries about her breath. As you can see by the Before Tongue Photo, she started out with a severely coated tongue. You can also see what the gauze looked like at the diagnosis – a brownish coating. The odor on the gauze was strong and pungent, and her Halimeter reading was 285, into the extreme range of halitosis. In addition, she had moderate periodontal disease. During that time we treated her with Tongue Rejuvenation and Gum Disease Therapy. 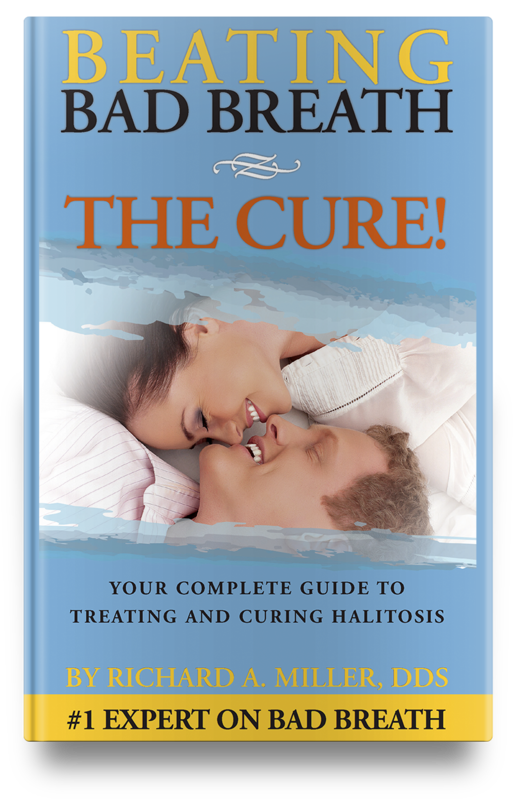 As treatment progressed we created a personal protocol to use at home and during the day to prevent the halitosis from coming back. 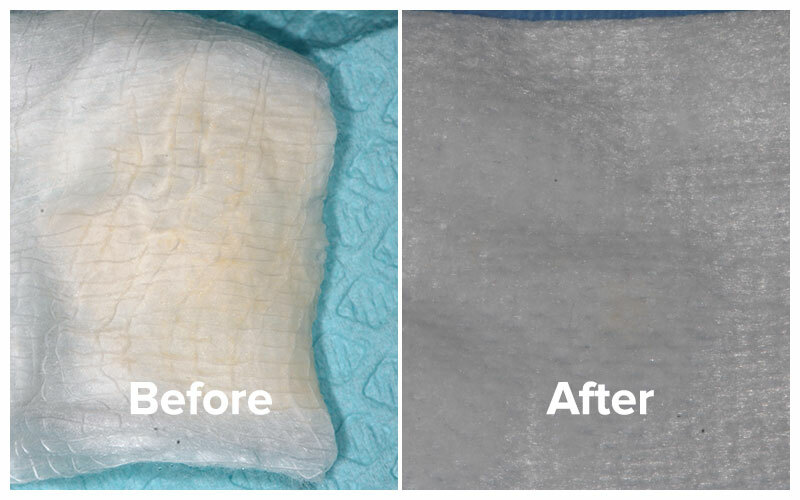 After treatment, her Halimeter reading was 65 and you can see by the Gauze (After Treatment) there is NO coating or biofilm. We had also eliminated her gum problem, two of the Big 4 – tongue biofilm, bleeding and/or diseased gums – causes for halitosis and began closing her spaces. After eliminating her halitosis, she has become a dental patient in our office for her restorative needs. For Laverne, bad breath really started after taking prescription medications which caused dry mouth and a bad taste. Bad breath was affecting her work and home relationships. The examination showed a whitish, yellowish coating extending over 75-80% of her tongue. Organoleptic testing showed a very strong and pungent odor. Using the Halimeter gave us readings of 167. January 2013 — Halimeter Reading 167. 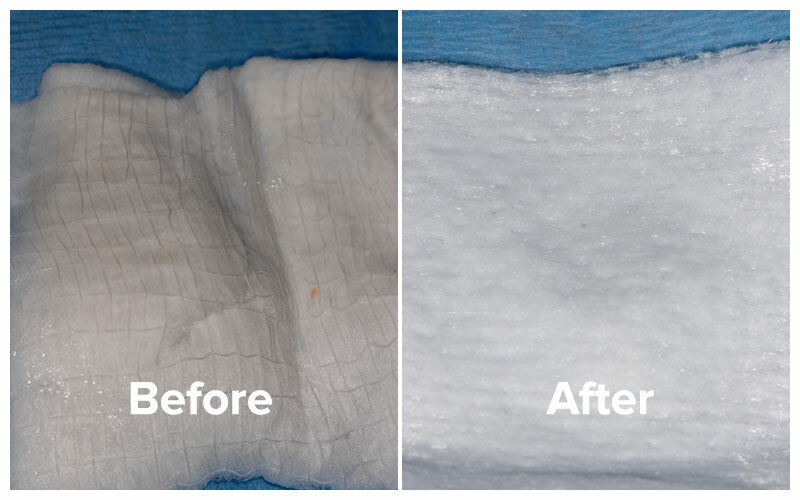 You can see by the before and after photos that her problem was mostly not all periodontal. During the Total Cure, we did treat her gum disease but in a conservative, less invasive way. The moderate areas were treated with conservative scaling and root planing, with special detail to the tiny accumulations of tartar under the gums, and the worst areas were also treated with a special wavelength laser that only removes inflamed gum tissue. 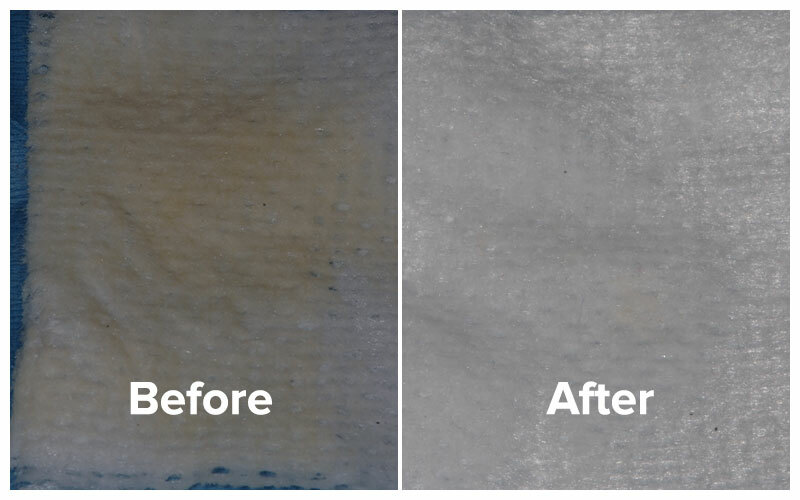 Thus, unlike surgery, she was able to keep her gum sand received healthy reattachments, the best barrier to prevent gum disease from coming back. June 2013 — Halimeter Reading 67. You can see by the tongue photos that there is a marked difference between the first visit and the last visit, with a two month break for health issues. In addition, please examine the gauze photos. 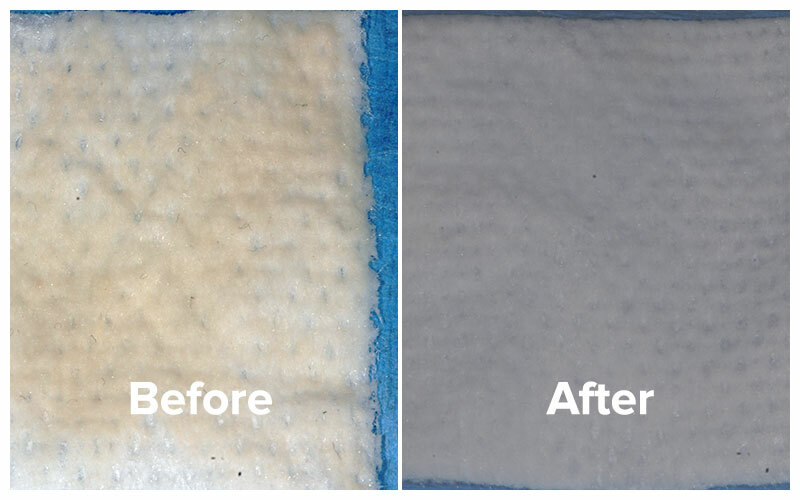 The distinctive color (and odor) at the first visit is gone, with the gauze totally white at the last visit. For Doris, bad breath was a severe social stigma. She also related that she spits mucous up all the time. She uses a sinus irrigator, removing the mucous and relieving her problem for 4-5 hours. In addition, she went to an ENT 5 years prior and he had told her she had no sinus problems. Her Halimeter reading was 286, far into the severe range and she had moderate gum disease with bleeding and gum and bone destruction form the inflammation. You can see from the photos what her tongue looked like before and after treatment. At her first maintenance visit six months after her cure, she reported that her brother is unable to notice any problems and the co-worker who gave her mints as a Christmas present, has congratulated her on unnoticeable breath. I know that I was a challenging case for you, but your patience and persistence made me feel that you cared about me at all times. And now that I have been cured of my “curse”, I recommend you as the best dentist I have ever seen, eventhough I do not tell them what brought me to see you. So, once again, my greatest thanks. You changed my life. For Kevin, bad breath was interfering with his personal relationship. Kevin came to see Dr. Miller because he could “feel” the tongue coating and because his girlfriend had told him he had bad breath. You can see by the gauze that he had a severe coating on his tongue. At that visit, the odor was strong and pungent and could be smelled half across the room before he sat down. What this reading alone tells you is that not only was Kevin cured, but the cure was maintained 5 months later with virtually the same reading. Also note the transformation of the gauze. 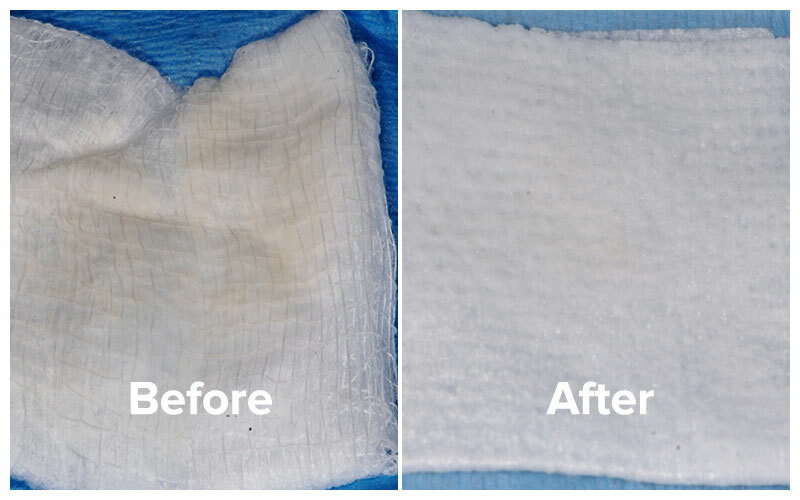 At first, he had a brownish coating on the gauze, but by the end of treatment there was no existing coating. Just wanted to let you know how grateful I am for your total cure treatment. Before I came to see you I realized that I was being held back in my entire life by the fear of others noticing my halitosis. Of course, as I told you, I could even smell it. But now, having been 9 months since the conclusion of my treatment, I could not be happier. Everything has taken a turn for the best – my social life, my job, and even my friends and family. Thank you Dr. Miller.